My mom used to keep this seasoning, made by Spice Islands, on hand. I used to put it on everything. It is a versatile mixture of spices that can be used to perk up the flavor of beef, pork, poultry, seafood, vegetables, soups, salads and eggs. Beau Monde is often used with homemade dips, salad dressings and sauces. This recipe is found on many different sites online. In a small mixing bowl, mix together all ingredients. Pour into a tightly closed jar and store in a cool, dry place. ¼ tsp asafoetida powder = ¼ tsp garlic powder + ¼ tsp onion powder. Despite its unpleasant aroma, asafoetida is considered both a digestive aid and antiflatulent. Nigella Sativa (ni-jel’-uh suh-tee-vah) – the seed of a flowering plant of the buttercup family native to southwest Asia. Used in traditional Lebanese, Indian, Serbian, Moroccan and Armenian cuisines. Traditional medicinal uses of black seed are extensive, including the treatment of skin conditions, respiratory infections, intestinal disorders and parasites, headaches, toothaches and more. Nigella helps promote lactation in nursing mothers and uterine contractions during labor, works as an insect repellent and is known to have anti-inflammatory, antibacterial and antioxidant properties. Studies suggest it also inhibits cancer cell progression and boosts the immune system. The seeds have a slightly bitter and peppery quality with a mild oregano-like flavor. They should be lightly toasted before using whole, crushed or ground. Sprinkle all ingredients over sliced meat or hamburger, then saute until done. Serve on flatbread, pita bread or flour tortillas with sliced tomatoes, thinly sliced onion & tzatziki (sour cream & cucumber sauce). Flatbread & tzatziki are available at many grocery & specialty stores. My favorites are at Trader Joe’s. I am making vanilla bean paste today. Contrary to the name, it is not actually a paste, but a thick syrup holding hundreds of vanilla seeds in suspension. It combines the best of both vanilla bean and extract. It’s like vanilla extract in its strength and how it is used but has the added visual benefit of the black seeds associated with a vanilla bean. I found easy to follow written and video instructions on Master Pastry Chef. Since I wanted to make enough for me and both of my daughters, I decided to double the recipe. 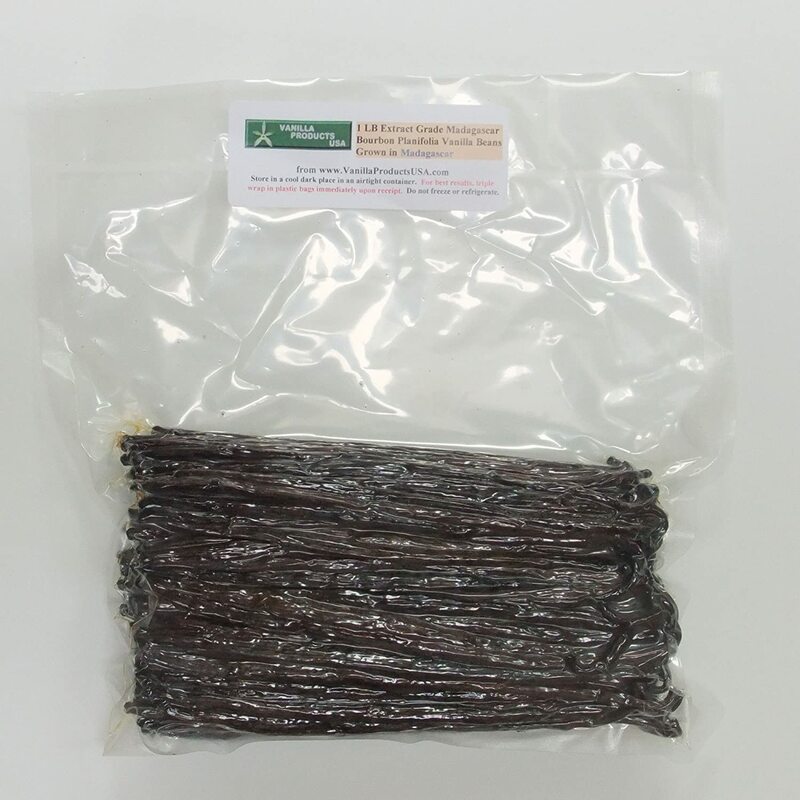 I found a great deal on 1 pound of Madagascar Bourbon Planifolia Extract Grade B Vanilla Beans. If you are like me, you might not know that “Bourbon” is not something that is added, but rather a particular type of vanilla beans. I also needed four 15-16 ounce bottles since my double recipe would make about 2 liters of delicious goo. After looking at dozens of varieties, I decided on some beautiful 17 oz bottles that came in a set of 6 for less than purchasing 4 separate bottles. After the vanilla beans and bottles arrived, I got started (okay, it was a few weeks later). First I had to cut open and scrape the seeds from one pound of vanilla beans. Do you know how many beans that is?? Neither did I until I started. Since they are dryer, Grade B vanilla beans are a little smaller than Grade A, so there are more of them to the pound – about 140 to 160! Fortunately my younger daughter was able to help. We ended up with almost a cup of vanilla seeds! Then I measured and boiled sugar & water, added the vanilla beans and seeds and boiled it for a few more minutes. 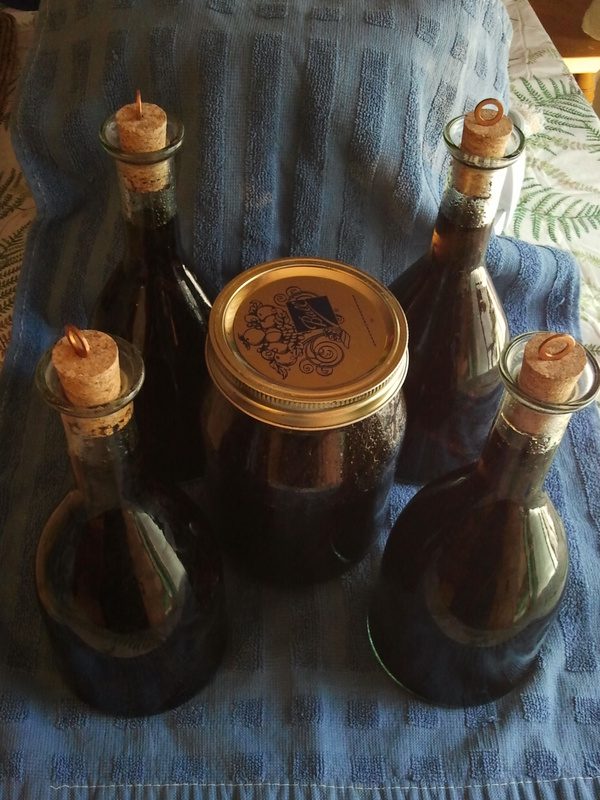 You have to pull out the vanilla beans & let them cool, cool the syrup, pour it into the bottles (about half full), then put the vanilla beans into the jar one or two at a time – very time consuming. It makes you appreciate why this stuff is so expensive to buy. With the narrow necks of the bottles I chose, I had to cut the vanilla beans in half to get them all in. I kept the best looking ones and put them in a quart mason jar with the remaining liquid, so if I want to put a whole bean in something I have them ready to go. Split each vanilla bean lengthwise and scrape out the seeds. Combine sugar and water and slowly bring to a boil. Add vanilla beans and seeds to the boiling syrup. Bring back to a boil, and boil for five minutes, then allow to cool. Pull beans out of liquid and put into a separate bowl, cool completely. Funnel liquid into a bottle or jar. Save beans for next batch, using 1/2 the amount of new beans + the old beans. He says that due to the nature of the paste it does not need to be refrigerated, but I am keeping mine in the fridge since I am a little paranoid about keeping a homemade sugar concoction in the cabinet. The Master Chef says 1 liter of this syrup last him for about a year – I think I’ve got enough for several years! He lists his cost as $61.60 – $60 for the beans and 50¢ for half a lime. I think those items must be more expensive in Australia. My total for twice as much was $39.03, $60.13 including the 4 bottles. Grade B beans have less water weight. You get more bean for the buck because you’re not paying for water. This also means that less water ends up in your extract – sounds good to me. With Grade A you pay for appearance, which doesn’t matter when making extract or paste. These are the same beans as Grade A, but at a fraction of the cost. More on vanilla beans & making extract from VanillaReview.com.